the diary of an overactive multi disciplined artist. As the year of the red fire Monkey is set to begin in February so is a new adventure! I'll be designing new products but they'll still have that naughty little streak of mishchief and fun characteristic of münano! Lots of great new items including children's clothing and textiles. so keep your peepers pealed because 2016 is going to be amazing! Sometimes I get to make interesting pieces like this birthday cactus! Bespoke pieces are great to make as I get the chance to work with clients who mostly are pretty care free and trusting... I really like the fact that they give me an idea then they let me run with it! My client and her husband love Mexico so she wanted to celebrate his birthday with something fitting. We discussed having an option where I'd work on hyper realism but making a soft sculpture is much more interesting then just producing something which looks too real. In that case you'd probably be better off buying a real cactus. Luckily my client is an art loving person so she was really pleased with the idea and went for it. I really love sculpture and this bespoke piece is an extension of my monsters... ah yes, those little beasties... I really must get back to them and create a bit more vegetation for them. A cactus forest might be worth exploring! If you'd like a bespoke soft sculpture then get in touch... I'm really looking forward to creating more made to measure sculptures so yes, drop me a line! We've been looking around for free web hosts and thanks to a very talented friend who told me about "TicTail" we now have a new on line shop. I've also worked on a new logo but it's far from finished... so many plans and so little time!!! We did make a start so... hopefully you'll agree that it looks pretty nice! As well as the web site we're also looking at re designing a few of our creatures... not because we don't love them but we've realised that some shapes work better then others. Also we'll be launching a few new products including illustrations and prints plus accessories too like brooches and a few choice bits and pieces still in our own quirky, kawaii style. We hope you like the new web shop. Let us know what you think and we'd love to hear from you though remember "Hunny Bunny" does have quite a temper on him and doesn't take criticism too well so please be kind! 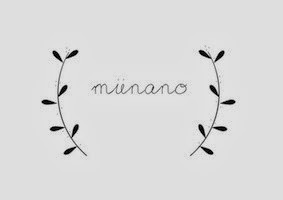 Munano is an original,kawaii,fun,creative project with a twist of darkness and naughtyness! It's the brain child of Portuguese designer maker and artist Deborah Daniel. /'m(u:)nan(u:)/ has been going since 2004.
this blog and its contents including designs are owned by ©münano.